Bored with bagging groceries, a college student named Kevin switches summer jobs. 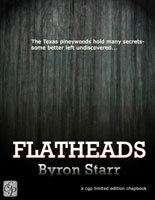 But signing on as a flathead - a logger in the East Texas woods - is the biggest mistake of his life. Kevin hasn't even broken in his new work boots before finding himself trapped in a cursed patch of forest. Worse, he realizes that his logging crew isn't alone: Something out there is hunting them - and it's hungry. In Flatheads, Byron Starr follows the trail blazed so famously by writers like Stephen King: Put average people in an everyday situation, then introduce a supernatural element and watch the sparks fly. Although his story is only novella-length, Starr builds believable camaraderie among the loggers, and persuades readers to care about Kevin, Derek, and their fellow flatheads. First, the author explains the process of felling trees so clearly that readers will be ready to pick up a chainsaw and get to work; next, he makes us feel like we're lost in the woods with the loggers: As the men barricade themselves inside an isolated cabin, frantically trying to keep a ravenous beast at bay, we're right alongside them, piling debris against the door. Starr demonstrates natural storytelling ability: The sun rises, the wind whistles, and a battered log truck climbs a steep hill as the novella opens, and readers will picture the scene easily because the writing is so descriptive. The author also knows how to use foreshadowing: A character claims that it's bad luck to start a job on a Friday, and his comment proves prescient when the loggers' equipment won't cooperate and felled trees seem to disappear. Despite the novella's strengths, there is room for improvement. Starr's word usage is sometimes repetitive ("Finally, after several missed attempts, Derek finally was able to start a tiny flame," "Derek's eyes found no sign of any other life other than the trees"). Scenes that take place outside of the woods allow Starr to reveal important details, but the tone of his writing seems off in those passages: an attendant interacts cheerfully with a nursing home resident; a man plays with his dog. The biggest problem is the story's uneven pacing: While the majority of the violence occurs abruptly in one chapter, much of the book is devoted to tense inactivity, filled with such minutiae as a character tossing a paper airplane at his sleeping friend. Mounting dread is a necessity in any good horror story, but trimming some of the fat here would have tightened up the narrative. Byron Starr wrote Flatheads after completing two full-length novels, and this strong effort hints at a promising future for the new author. Starr's fiction-writing is on hiatus at the moment; we can only hope that he picks up his pen again soon to give us more creepy East Texas tales.